Despite what people might think, I welcome the release of the new edition of “Microsoft Office 365 Administration Inside Out.” There is nothing like competition to drive an increase in standards, and even though I think the Office 365 for IT Pros eBook (also available from Amazon Kindle) is pretty decent already, we can always do better. The Microsoft Press current book service aims to provide content that stays current with rapidly changing software. Given the number of changes appearing in all its applications, Office 365 is certainly in the “rapidly changing” category. Microsoft Press issues updates for 12 to 18 months after publication in web editions of their books, which is the only feasible way to handle the problem. What’s not clear is how often updates appear. Microsoft Press says updates will be available “depending on the frequency of significant updates to the software.” I guess it all depends on your definition of significant updates. 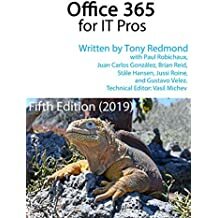 If you look at the Office 365 for IT Pros change log, you get some idea of the kind of changes we have tracked in the 4th edition of the book since its publication on June 1, 2017. So far, we have generated 25 updates (almost once a week) for the book. Given my experience as a Microsoft Press author, I suspect that’s more than Microsoft Press will do. We shall see. One of the problems we have with Office 365 is tracking the number of changes. A flood of blogs appears from Microsoft to announce changes in applications. Even more appear to cover updates in related technologies like Azure Active Directory or Azure Information Protection. Many changes slip into Office 365 without an announcement. Teams, for instance, makes many updates to client user interfaces. The Teams release notes are an excellent resource for tracking changes, even if some small updates don’t show up there. The Office 365 Roadmap is helpful for giving a heads-up as to what should show up in Office 365 in the future, especially now that Microsoft has updated the roadmap with dates for when a feature is added, last modified, and when it is scheduled to appear. However, the problem for roadmap items is that they cover all Office 365 plans and are not specific to a tenant – or more precisely, to the mix of licenses bought and used by a tenant. The fact that Microsoft is gradually introducing new features for the high-end Office 365 E5 plan is also a complication. Although features are often available as an add-on (MyAnalytics and Advanced Threat Protection are examples), sometimes they are not (like Alert Policies in the Security and Compliance Center). This creates the problem of what to describe in a book. It’s a quandary, and not one that we solve as well as we might because invariably our interest is attracted to new and interesting technology of the type often included in E5. For all our complaints about the difficulty of tracking change inside Office 365, it’s still an enjoyable and worthwhile activity. We hope that the Microsoft Press team has as much fun updating their book as we have had with ours. This entry was posted in Cloud, Email, Office 365 and tagged Microsoft Press, Office 365 book. Bookmark the permalink. When will the 5th edition of Office 365 for IT Pros be released? Good question. We have not made any decision yet.